Scott Kelly ‏(@StationCDRKelly): "#Italy and the #Alps last night were breathtaking! #YearInSpace"
Scott Kelly (‏@StationCDRKelly): "Day 289. Out over the blue. #GoodNight from @space_station! 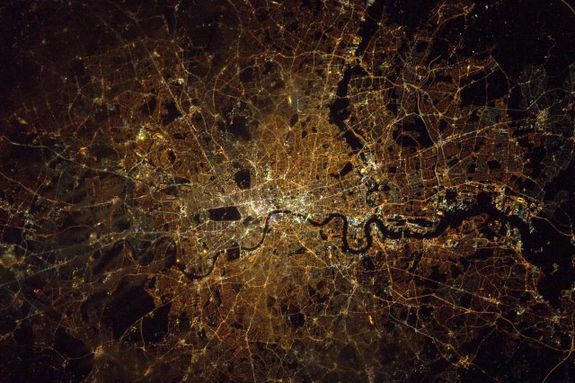 #YearInSpace"
Tim Peake (‏@astro_timpeake): "#London midnight Saturday – I’d rather be up here…but only just!! #toughcall https://flic.kr/p/DuxPKA"
Mars' seasonal cap of carbon dioxide ice has eroded many beautiful terrains as it sublimates (goes directly from ice to vapor) every spring. In the region where the High Resolution Imaging Science Experiment (HiRISE) camera on NASA's Mars Reconnaissance Orbiter took this image, we see troughs that form a starburst pattern. In other areas these radial troughs have been refered to as spiders, simply because of their shape. In this region the pattern looks more dendritic as channels branch out numerous times as they get further from the center. The troughs are believed to be formed by gas flowing beneath the seasonal ice to openings where the gas escapes, carrying along dust from the surface below. The dust falls to the surface of the ice in fan-shaped deposits. Scott Kelly (‏@StationCDRKelly): "#EarthArt Out of #Africa. #GoodMorning people of Earth from @space_station! #YearInSpace"
ESA astronaut Tim Peake took this picture during his 4 hour 43 minute spacewalk to replace a failed power regulator and install cabling. The meticulously planned and executed sortie was stopped early after fellow spacewalker NASA astronaut Tim Kopra reported a small amount of water building up in his helmet. The two Tims worked in close cooperation with each other to return to the Space Station, with NASA commander Scott Kelly and cosmonaut Sergei Volkov waiting inside to help them out of their suits. Tim commented on this picture: "Today’s exhilarating spacewalk will be etched in my memory forever – quite an incredible feeling!" Scientists with NASA’s New Horizons mission have assembled this highest-resolution color view of one of two potential cryovolcanoes spotted on the surface of Pluto by the New Horizons spacecraft in July 2015. This feature, known as Wright Mons, was informally named by the New Horizons team in honor of the Wright brothers. At about 90 miles (150 kilometers) across and 2.5 miles (4 kilometers) high, this feature is enormous. If it is in fact an ice volcano, as suspected, it would be the largest such feature discovered in the outer solar system. Mission scientists are intrigued by the sparse distribution of red material in the image and wonder why it is not more widespread. Also perplexing is that there is only one identified impact crater on Wright Mons itself, telling scientists that the surface (as well as some of the crust underneath) was created relatively recently. This is turn may indicate that Wright Mons was volcanically active late in Pluto’s history. This processed image is the highest-resolution color look yet at the haze layers in Pluto’s atmosphere. Shown in approximate true color, the picture is constructed from a mosaic of four panchromatic images from the Long Range Reconnaissance Imager (LORRI) splashed with Ralph/Multispectral Visible Imaging Camera (MVIC) four-color filter data, all acquired by NASA’s New Horizons spacecraft on July 14, 2015. The resolution is 0.6 miles (1 kilometer) per pixel; the sun illuminates the scene from the right. As they settle down through the atmosphere, the haze particles form numerous intricate, horizontal layers, some extending for hundreds of miles around Pluto. The haze layers extend to altitudes of over 120 miles (200 kilometers). Scott Kelly ‏(@StationCDRKelly): "Had a great view of #WashingtonDC yesterday morning! #YearInSpace"
Scott Kelly (‏@StationCDRKelly): "#blizzard2016 clearly seen off the #EastCoast as the sun begins to rise. Hope all OK! #BlizzardJonas #YearInSpace"
Scott Kelly ‏(@StationCDRKelly): "Rare #thundersnow visible from @Space_Station in #blizzard2016! #Snowzilla #snowmaggedon2016 #YearInSpace"
This half-lit view of Enceladus bears a passing resemblance to similar views of Earth's own natural satellite, but the similarities end there. Earth's rocky moon is covered in dark, volcanic basins and brighter, mountainous highlands -- both exceedingly ancient. The surface of icy Enceladus is uniformly bright, far brighter than Earth's moon. Large areas of Enceladus' surface are characterized by youthful (on geologic timescales), wrinkled terrains. Scott Kelly ‏(@StationCDRKelly): "This is a good example of the air pollution that exists across large parts of Asia. #YearInSpace"
Here, Cassini has captured Enceladus (313 miles or 504 kilometers across) above the rings and Rhea (949 miles or 1,527 kilometers across) below. The comparatively tiny speck of Atlas (19 miles or 30 kilometers across) can also be seen just above and to the left of Rhea, and just above the thin line of Saturn's F ring. Scott Kelly ‏(@StationCDRKelly): "Honoring #MLKDay from @space_station. "The journey of a thousand miles begins with the smallest step." #YearInSpace"
ESA astronaut Tim Peake (@astro_timpeake) took this photograph over the west coast of Canada from the International Space Station on Dec. 31, 2015, and shared it with his Twitter followers on Jan. 5, writing, "I was lucky enough to fly a helicopter in these Rocky Mountains once – I’m a bit higher this time! #Principia"
The photograph shows Canada's Coast Range of mountains, with King Island and Burke Channel in the center. The Pacific Ocean is visible at the bottom and north is to the left. NGC 3597 is located approximately 150 million light-years away in the constellation of Crater (The Cup). Astronomers study NGC 3597 to learn more about how elliptical galaxies form — many ellipticals began their lives far earlier in the history of the universe. Older ellipticals are nicknamed “red and dead” by astronomers because these bloated galaxies are not anymore producing new, bluer stars, and are thus packed full of old and redder stellar populations. Scott Kelly ‏(@StationCDRKelly): "Advice from a #volcano: keep your inner fire burning. #YearInSpace"
ESA astronaut Tim Peake during his 4 hour 43 minute spacewalk to replace a failed power regulator and install cabling. Scott Kelly (‏@StationCDRKelly): "More morning's #aurora! #YearInSpace"
Scott Kelly (‏@StationCDRKelly): "Day 293. 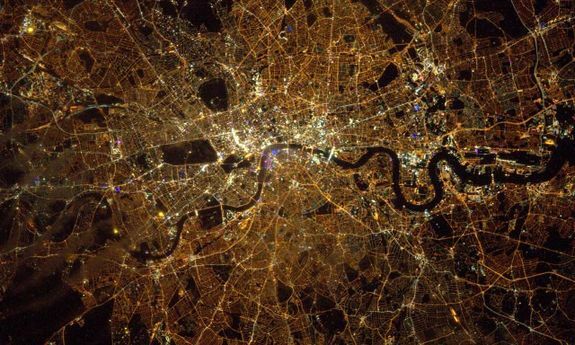 #Spacewalk on a new dawn & #UK will have a new star out there! #GoodNight from @space_station! #YearInSpace"
Astronomers have made the most detailed study yet of an extremely massive young galaxy cluster using three of NASA’s Great Observatories, as described in our latest press release. This multi-wavelength image shows this galaxy cluster, called IDCS J1426.5+3508 (IDCS 1426 for short), in X-rays from the Chandra X-ray Observatory in blue, visible light from the Hubble Space Telescope in green, and infrared light from the Spitzer Space Telescope in red. This rare galaxy cluster, which is located 10 billion light years from Earth, weighs almost 500 trillion Suns. This object has important implications for understanding how these mega-structures formed and evolved early in the Universe. Astronomers have observed IDCS 1426 when the universe was less than a third of its current age. It is the most massive galaxy cluster detected at such an early age. First discovered by the Spitzer Space Telescope in 2012, IDCS 1426 was then observed using the Hubble Space Telescope and the Keck Observatory to determine its distance. Observations from the Combined Array for Millimeter Wave Astronomy indicated it was extremely massive. New data from the Chandra X-ray Observatory confirm the galaxy cluster mass and show that about 90% of the mass of the cluster is in the form of dark matter, the mysterious substance that has so far been detected only through its gravitational pull on normal matter composed of atoms. This core, while still extremely hot, contains cooler gas than its surroundings. This is the most distant galaxy cluster where such a “cool core” of gas has been observed. Astronomers think these cool cores are important in understanding how quickly hot gas cools off in clusters, influencing the rate of stars at which stars are born. This cooling rate can be slowed down by outbursts from a supermassive black hole in the center of the cluster. Apart from the cool core, the hot gas in the cluster is remarkably symmetrical and smooth. This is another piece of evidence that IDCS 1426 formed very rapidly and quickly in the early Universe. Despite the high mass and rapid evolution of this cluster, its existence does not pose a threat to the standard model of cosmology. These results were presented at the 227th meeting of the American Astronomical Society meeting in Kissimmee, Florida. They are also in a paper accepted to The Astrophysical Journal and available online. The authors are Mark Brodwin (University of Missouri in Kansas City, Missouri), Michael McDonald (Massachusetts Institute of Technology in Cambridge, Massachusetts), Anthony Gonzalez (University of Florida in Gainesville, Florida), Spencer Stanford (University of California in Davis, California), Peter Eisenhardt (California Institute of Technology in Pasadena, California), Daniel Stern (California Institute of Technology in Pasadena, California) and Gregory Zeimann (Pennsylvania State University in University Park, Pennsylvania). The component images of this scene were taken on Dec. 18, 2015, by the Mast Camera (Mastcam) on NASA's Curiosity Mars rover during the 1,197th Martian day, or sol, of the rover's work on Mars. Scientists may have spotted the most powerful supernova ever seen, some 3.8 billion light years away in deep space. Named ASASSN-15lh, it looks like a huge ball of hot gas and is radiating the energy of hundreds of billions of Suns. Ten miles across at its center, this object is putting on quite a show, creating a cosmic explosion about 200 times more powerful than a typical supernova and more than twice as luminous as the previous record-holding supernova. European Space Agency (ESA) astronaut Tim Peake (@astro_timpeake) shared this photo taken aboard the International Space Station on Jan. 11, 2015, during preparations for a spacewalk, or extra-vehicular activity (EVA). Peake wrote, "Final suit fit check prior to Friday's EVA – feels just great! #Principia #spacewalk"
On Friday, Jan. 15, Expedition 46 flight engineers Tim Kopra of NASA and Tim Peake of ESA will venture outside the space station’s Quest airlock to replace a failed voltage regulator that compromised one of the station’s eight power channels last November. The spacewalk is scheduled to begin at 7:55 a.m. EST and will be the third in Kopra’s career and the first for Peake, and the 192nd for maintenance of the space station. It will be the 35th spacewalk using the U.S. Quest airlock. Additional tasks include deploying cables for the future installation of an International Docking Adapter that will accommodate U.S. commercial crew vehicles, and retrieving a broken light from a truss camera. This NASA/ESA Hubble Space Telescope image shows the spiral galaxy NGC 4845, located over 65 million light-years away in the constellation of Virgo (The Virgin). The galaxy’s orientation clearly reveals the galaxy’s striking spiral structure: a flat and dust-mottled disk surrounding a bright galactic bulge. NGC 4845’s glowing center hosts a gigantic version of a black hole, known as a supermassive black hole. The presence of a black hole in a distant galaxy like NGC 4845 can be inferred from its effect on the galaxy’s innermost stars; these stars experience a strong gravitational pull from the black hole and whizz around the galaxy’s center much faster than otherwise. From investigating the motion of these central stars, astronomers can estimate the mass of the central black hole — for NGC 4845 this is estimated to be hundreds of thousands times heavier than the sun. This same technique was also used to discover the supermassive black hole at the center of our own Milky Way — Sagittarius A* — which hits some four million times the mass of the sun. The galactic core of NGC 4845 is not just supermassive, but also super-hungry. In 2013 researchers were observing another galaxy when they noticed a violent flare at the center of NGC 4845. The flare came from the central black hole tearing up and feeding off an object many times more massive than Jupiter. A brown dwarf or a large planet simply strayed too close and was devoured by the hungry core of NGC 4845. Scott Kelly ‏(@StationCDRKelly): "Day 285. South East #Asia giving us the green lights tonight! #GoodNight from @space_station! #YearInSpace"
Bow shocks thought to mark the paths of massive, speeding stars are highlighted in these images from NASA's Spitzer Space Telescope and Wide-field Infrared Survey Explorer, or WISE. Cosmic bow shocks occur when massive stars zip through space, pushing material ahead of them in the same way that water piles up in front of a race boat. The stars also produce high-speed winds that smack into this compressed material. The end result is pile-up of heated material that glows in infrared light. In these images, infrared light has been assigned the colored red. Green shows wispy dust in the region and blue shows stars. The two images at left are from Spitzer, and the one on the right is from WISE. The speeding stars thought to be creating the bow shocks can be seen at the center of each arc-shaped feature. The image at right actually consists of two bow shocks and two speeding stars. All the speeding stars are massive, ranging from about 8 to 30 times the mass of our sun. Scott Kelly ‏(@StationCDRKelly): "Day 288. Dream big. #GoodNight from @space_station! #YearInSpace"
A new video taken by a telescope in space shows a small slice of the awesome beauty of Earth's closest star. NASA's Solar Dynamics Observatory captured the video, which shows "cascading magnetic arches" on the sun after a filament of solar material erupted from the star on Dec. 16 to 17, the space agency said. The arches look like they're glowing as they give off ultraviolet light, which is actually invisible to the human eye — but researchers colorized it to make the details of the magnetic arches really pop. Janus and Tethys demonstrate the main difference between small moons and large ones. It's all about the moon's shape. Moons like Tethys (660 miles or 1,062 kilometers across) are large enough that their own gravity is sufficient to overcome the material strength of the substances they are made of (mostly ice in the case of Tethys) and mold them into spherical shapes. But small moons like Janus (111 miles or 179 kilometers across) are not massive enough for their gravity to form them into a sphere. Janus and its like are left as irregularly shaped bodies. Saturn's narrow F ring and the outer edge of its A ring slice across the scene. This view looks toward the unilluminated side of the rings from about 0.23 degrees below the ring plane. The image was taken in visible green light with the Cassini spacecraft narrow-angle camera on Oct. 27, 2015. Mars' Schaeberle Crater is a large, heavily-infilled crater with many interesting features. This image shows a window into the crater fill deposit, showcasing eroding bedrock and aeolian landforms. This pit is located near the geometric center of our image, making it a central pit crater. Central pit craters are thought to form from impact melt draining through subsurface cracks in the deepest part of the crater shortly following impact. A closeup image shows light-toned bedrock and a small cliff that appears to be weathering away. Below the cliff there are several different types of aeolian features, including ripples and transverse aeolian ridges (TAR). The sand that forms the small, bluish ripples may be weathering out of the cliff face, in contrast to the larger, light-toned TAR which are thought to be currently inactive. Scott Kelly ‏(@StationCDRKelly): "Day 280. First day of 2016, the year I return to #Earth. #GoodNight from @space_station! #YearInSpace"
Scott Kelly ‏(@StationCDRKelly): "Sandy and green on the South #Indian coast. #YearInSpace"
Scott Kelly ‏(@StationCDRKelly): "Day 295. #Earth. Mysterious and enchanting, she sleeps. #GoodNight from @Space_Station! #YearInSpace"
NASA and NOAA satellites are tracking the large winter storm that is expected to bring heavy snowfall to the U.S. mid-Atlantic region on Jan. 22 and 23. NASA-NOAA's Suomi NPP satellite snapped this image of the approaching blizzard around 2:35 a.m. EST on Jan. 22, 2016 using the Visible Infrared Imaging Radiometer Suite (VIIRS) instrument's Day-Night band. Scott Kelly ‏(@StationCDRKelly): "Day 284. The Big Easy at twilight. #GoodNight from @space_station! #YearInSpace"
Scott Kelly ‏(@StationCDRKelly): "Sad to learn of the death of musician @DavidBowieReal whose inspiration lives on "far above the world" #YearInSpace"
Scott Kelly (‏@StationCDRKelly): "#Andes When you believe, you can move #mountains. Or move over them. #YearInSpace"